This 17 day tour begins in Beijing, the capital of China. After arriving in Beijing and getting settled at the hotel, the group will cycle through Beijing’s old neighborhoods and along the narrow alleys called hutongs. The following day the group will tour by bike to visit Tian'anmen Square, Forbidden City and the Temple of Heaven. On the third day, the group will take a motor vehicle excursion to the Great Wall and Ming Tombs then fly to Xi'an in the evening. On the fourth day in Xi’an, the group will visit the Terracotta Warriors by motor vehicle and then explore the city wall by bike in the afternoon followed by a Tang Dynasty cultural show in the evening. The next day there will be a bike tour to Wild Goose Pagoda and a visit to the Shaanxi Provincial Museum followed by an evening flight to Chengdu. On the sixth day in Chengdu, the group will cycle to visit the Panda Research Base and a visit to Wenshu Monastery. The following day the group will cycle first to Huanglongxi, a historic village on the Fu River for lunch then head to Meishan where the group will meet a vehicle for transport to Leshan. The following day, the group will visit the Giant Sitting Buddha (232 feet, 71 m). Afterwards we head east to Rongxian for another to visit China's second largest Buddha (193 ft, 58.7 m) and then take motor transport to Zigong, the location of dinosaur and salt museums. On the ninth day, we will then visit Dazu. Here we will spend two nights to give us time to cycle to a number of Confucian, Taoist and Buddhist sculptures dating from the 9th to 13th centuries. On the tenth day, the group will travel to Chongqing by bus and board the luxury Yangtze River Cruise boat in the evening. This is a three-day cruise through the dramatic Three Gorges and past the construction site of the world’s largest dam, the Three Gorges Dam. When arriving in Wuhan on the fourteenth day, the group will transfer to airport for the flight to Shanghai. Shanghai is China’s most modern city and home to 13 million people. There will be biking in Shanghai and dinning on the TV tower to get a bird’s eye view on old and new Shanghai. A city tour by bike in the old town, the Bund, Yu Garden and the Shanghai Museum. Evening cruise on Huangpu River. The tour will end on the 17th day and include transport to the Shanghai Airport for connections home. Day 1: Beijing, group meets. Biking in Beijing's "hutong" - narrow allies to get a feel for the rapidly disappearing Old Beijing. Includes: (B), (L), (D). Day 2: Beijing, city tour by bike. Tian'anmen Square, Forbidden City, Summer Palace and Temple of Heaven. Includes: (B), (L), (D). Day 3: Beijing/Xi'an, city tour by bike. Tian'anmen Square, Forbidden City, Summer Palace and Temple of Heaven. Includes: (B), (L), (D). Day 4: Xi'an, excursion by motor vehicle to Terracotta Warriors. Bike around the city wall. Tang Dynasty cultural show in the evening. Includes: (B), (L), (D). Day 5: Xi'an/Chengdu, city tour by bike to Shaanxi Provincial Musuem, Wild Goose Pagoda and Muslin Quarter. Fly to Chengdu in the evening. Includes: (B), (L), (D). Day 6: Chengdu, city tour by bike and visit to Panda Breeding Research Base. Includes: (B), (L), (D). Day 7: Leshan. Visit the China's largest Buddha. Includes: (B), (L), (D). Day 8: Zigong-Rongxian-Big Buddha. Zigong, Dinosaur and Salt Museums. Includes: (B), (L), (D). Day 9: Dazu, bike tour to Beishan Grottos. Includes: (B), (L), (D). Day 10: Dazu/Chongqing, bike tour to Baoding site then transfer to Chongqing to board the luxury Yangtze River Cruise boat in the evening. Includes: (B), (L), (D). Day 11: Yangtze River. Three Gorges River Cruise. Includes: (B), (L), (D). 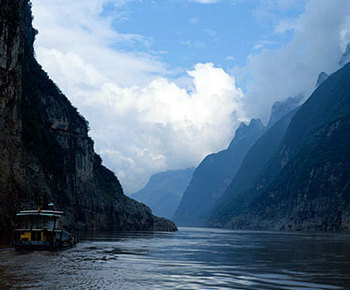 Day 12: Yangtze River. Three Gorges River Cruise. Includes: (B), (L), (D). Day 13: Yangtze River. Three Gorges River Cruise. Includes: (B), (L), (D). Day 14: Wuhan/Shanghai. Dock at Wuhan, get transferred to airport for the connection flight to Shanghai. Biking in new metropolitan Shanghai (Putong), dinning on the TV tower to get a bird's eye view on old and new Shanghai. Includes: (B), (L), (D). Day 15: Shanghai, city tour by bike in the old town, the Bund, Yu Garden, Shanghai Museum etc. Evening cruise on Huangpu River. Includes: (B), (L), (D). Day 16: Shanghai. Free day to be spent as you please. Because of the favorable location of the hotel, you can easily stroll in the old streets and shopping centers. Includes: (B). Day 17: Shanghai. Tour ends. Transport to Shanghai Airport. Includes: (B).